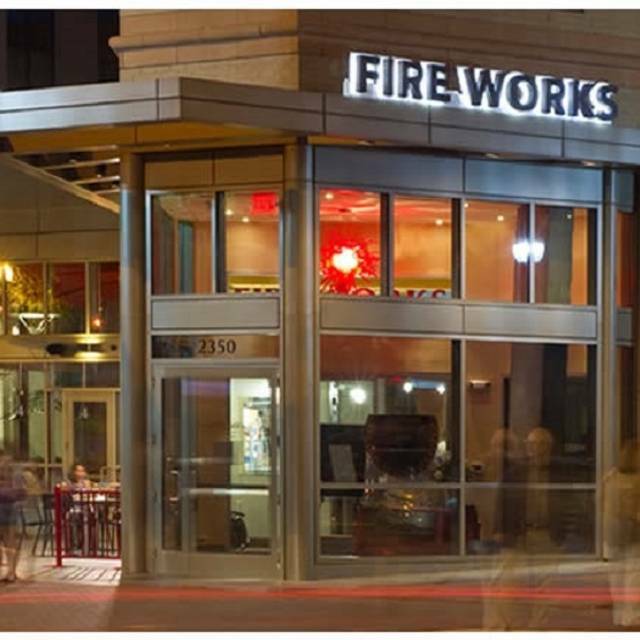 You must make reservations at least 5 minutes in advance of the time at Fire Works - Arlington. Street parking plus Garage Parking directly underneath the Courthouse Plaza. We offer private dining in our Private Dining Room that seats approximately 35 people. We also offer larger buyout events if needed. Please contact Jason@fireworkspizza.com for questions and booking. Tuscarora Mill's owners and chef have created a winning pizza restaurant by opening Fire Works in Leesburg in 2006. Next comes our “city-fied” addition of the ultimate pizzeria and bar. How do we do it? Great pizzas from the five-ton wood fired oven , a superb selection of draft and bottled beers, perfectly picked wine list and cool cocktails are a very good start. Add a comfy urban setting that puts you at ease while it wakes up your senses and we are pretty well along the way. Finish with a commitment to deliver superb food and sincere caring service and you’ve got the The Fire Works! Gluten-Free Pizzas: Add $3 for 10" / $4 for 14"
Proteins: sausage, anchovies, meatballs, chicken, pepperoni, lamb sausage, chorizo, salami, bacon, Virginia ham, prosciutto, shrimp (+$2 / +$4), clams (+$2 / +$4). Veggies: roasted onions, red onions, tomatoes, mushrooms, green peppers, olives, apples, roasted garlic, artichoke, roasted peppers, spinach, eggplant, rosemary, pineapple. Cheeses: house blend, brie, gorgonzola, feta, local goat, mahon, parmesan, fresh mozzarella, smoked mozzarella, grana, fontina. Salsa borracho, onion, corn tortilla. Cuban slaw (pickles, Dijon, gruyere). Figs, blackberries, spiced pecans, crumbled gorgonzola, maple dressing. Who says you can only have Tacos on Tuesdays? Dinner here is usually great! Brunch, however was lacking. It was Easter Sunday and the only place that still had reservations, so we though we would try it. Not only did they have reservations left, the place was basically empty. Since booking the reservation, they changed the menu to small plates for brunch. It was $26 for all you can eat, but you can only have two at a time. Most of them were okay. Decent but nothing great. The French toast and the FW potato were my favorites. I’m glad we did all you could eat, because I would have been very disappointed if I only had one of two. Overall meh. It ended up costing almost $100 for the two of us and there was nothing special about it. I was looking forward to the full brunch menu. I will be back for dinner though! Great beer selection, good food. Best make a reservation on a fri or Sat night, but can be done an hr or two ahead. Pizza was good, service not so much. Service was terrible - had to wait over 30 min for check and had to ask for it twice. Decent, serviceable pizza. Good happy hour draft deals. The food was great, but the service was a little slow. We had a party of 7 and the table was a bit tight with all the pizzas. But we all enjoyed our food a lot! Great pizza. Wood fired and cooked perfectly. Service was attentive and fast. I had the fireworks pizza. Their tomato sauce isn’t too acidic and does not overpower the flavor of the ingredients. Drink prices are reasonable and they have a big selection of beer and also liquor, particularly whisky. Did I mention it’s excellent pizza? Great pizza and a huge beer list. One of our favorites in Arlington! I made a reservation for Valentine’s Day and despite I was late we got a table in less than 10 minutes the service was great and the food amazing they brought the food to the table in no time I will definitely come back can’t wait to try the other pizza flavors. Great evening at Firework. They did a good job on a busy Valentine Day. Always love the beer selection, garlic dough knots, and designer pizzas. 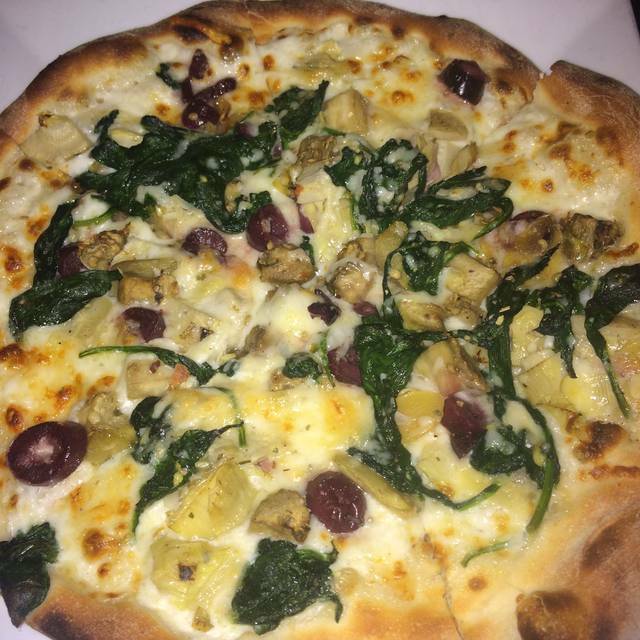 One of the most awful pizzas I have ever eaten in my life , it gave me the worst mood. Don't go unless you enjoy eating badly. I am a regular at Fireworks and would usually say that I really like it. Unfortunately though, lately, the service has been pretty bad. Tonight, it took 15 minutes for someone to even stop by the table and greet us and suggest they bring us water. The guy who stopped by was nice enough, and he got our drinks and took our order. However, mid-way through the meal, a different person stopped by and said, "oh I didn't introduce myself yet but I'm actually your waiter." It was awkward given our original server was still working the table directly next to us. And, despite our "new waiter," the service was terribly slow, we were given the wrong bill, it took forever to get boxes for our leftovers, and eventually we left a lower than usual tip just to get out of there because our waiter wasn't coming back to collect the bill. Fireworks can and should do better, but this was pretty bad to say the least and it seems to be the trend they're heading towards right now. A great pizza stop for anyone...kids included!! They were not doing their regular crust...but, the gluten free was terrific!! Food is amazing. Love the options. The margherita pizza was just ok, should have used much more mozzarella. Service was good and the prices were awesome for the area. I would go back and try a different pizza. Great place to eat before a movie. Decent pizza and excellent French Toast! They have a great beer selection and a fun cocktail menu. The portions were large and they have choices to make most people happy. It is a fun and casual place and we will be back. The Chocolate cake was the best I have ever had. Great happy hour specials and a great place to grab dinner. We loved the pizza! Good food with great service! Our group of 6 enjoyed all of the food, and were accommodated well. It was a quieter Sunday night, but no complaints. The server also brought us a birthday dessert! Fantastic pizza, wish I lived near this place! Crusts thin, not sweet, great flavor choices on the build your own menu. We were headed to the Kennedy Center from Central Va. and needed a Celiac-friendly option for supper before the show. This place worked out very well. Great menu and good service. Summary: Delicious pizza, great value. I will definitely be going back. Food: I ordered the quattro carne and my friend ordered the siciliana—both were delicious. Service: Our server was polite and friendly, and our food arrived quickly. Ambience: Tables were spaced comfortably; booths were spacious; noise level was moderate. Value: My 14" pizza was ~$21. I'd say it was a great value—given the area in which the restaurant is located—even for a millennial such as myself! Overall a good pizza place. Our table server was great and they make decent pizza but the host failed to acknowledge our reservation (even though I told him I had a reservation under my name)...prompting me to get an email from open table asking why I didn’t show up. The pizza is great and the happy hour specials are very good. We just went in very casual after working out and were not at all out of place! Great for casual dining, date night, or night out. We got the segundo and margherita pizza. They were delicious but could have used a few more minutes in the oven. The cheese on the defunds wasn’t fully melted and the pizza was slightly floppy. We sat outside and loved all of the hanging string lights above. It was a busy night but we could have used some more attention from our server. I’m not sure why this place has such high reviews. The pizza was at best mediocre, no flavor, and although we were literally the only table occupied in the dining room, the service was subpar. After our pizzas were served the waiter literally never came back....except of course to see if we were done so he could bring our bill. I would suggest going ANYWHERE in Arlington instead of Fire Works. Stopped in at FW Pizza in Arlington after a movie on a Wednesday evening. Place was fairly busy, including the bar. Ordered one of their specialty pizzas for me and my husband ordered the salmon entree. My 'Black Sheep' pizza, with ground lamb, was really a terrific mixture of flavors with a nice, tasty light crust. My husband enjoyed the lamb entree as well. Nice wine by the glass choices. And the service was phenomenally fast. Loved it! They have a great selection of delicious-looking things on the menu for all types of eating occasions. I had the 10 inch Gluten Free white sauce shrimp pizza. Can't remember the exact name of it. I was let down as the pizza was cut into six pieces and 5 pieces of the pizza had one piece of shrimp on it, 1 piece had just the sauce and cheese on it. Pretty lame on the amount of shrimp they give you. My wife had a pizza with the meatballs and she was commenting on how many and how big they were. Meatballs apparently are that much less that those they coat the pizza with. Waiter came back to our table one time. That’s it. And that’s only after we flagged him down. The other servers were flagged down by us to get drink refills. Either too many tables for each waiter or he was just terrible. A mixed bag. Could have been better. The shrimp did not agree with one in our dining party. The bitter cocktail is in fact quite/too bitter. Good wings. Nice outdoor seating area. Food was fresh and delicious, and reasonably priced. Hit the spot. Really enjoyed our dinner! We had greed salad, margherita pizza and fire works pizza. All fantastic. We were visiting D.C. and randomly chose Fireworks Pizza for lunch with several of our friends who live in the area....and what a great "random" choice this turned out to be! I cannot say enough about the wonderful customer service that we received from the manager, Jason, the lovely hostess (Laura, I think? Sorry, I cannot recall her name!) and our PHENOMENAL server, Toufik. While we enjoyed the food (mostly pizzas and salads), the service made our gathering of 16 friends a fun, relaxing and truly enjoyable experience. Toufik single handedly managed our drink and meal orders with the additional challenges of willingly accomodating our requests for separate checks, meal substitiutions, attention to food allergy needs for my son,etc...Toufik efficiently and cheerfully checked on us and refilled water glasses and drinks at appropriate intervals and delivered our hot, freshly prepared food in record time. We sincerely appreciate that we were seated at two large tables in a separate room so that "the guys" could mix, mingle and tell "war stories" at one table while the ladies and kids could enjoy their meal and conversations at the other (and all without disturbing patrons in the main dining area). As mentioned, we enjoyd the food. I can personally vouch for my husband's Black Sheep pizza and the wild salmon entree. The lamb sausage was a unique, tasty addition to the pizza and my wild salmon was cooked a perfect medium rare and seasoned to perfection. Toufik kindly allowed me to substitute sauteed spinach and mushrooms for the risotto which made this a truly delicious meal. My son loved his prosciutto pizza and everyone else gave "thumb's up" to their food choices. Based on our experience, I highly recommend Fireworks pizza for a casual meal with friends and family...and ask for Toufik!